By seeing this picture I remember a Malayalam film dialogue by comedian plus National Award winner actor Salim kumar "kanan lukkillelum enikku nalla budhiya":):) I don't have look but I'm brilliant! 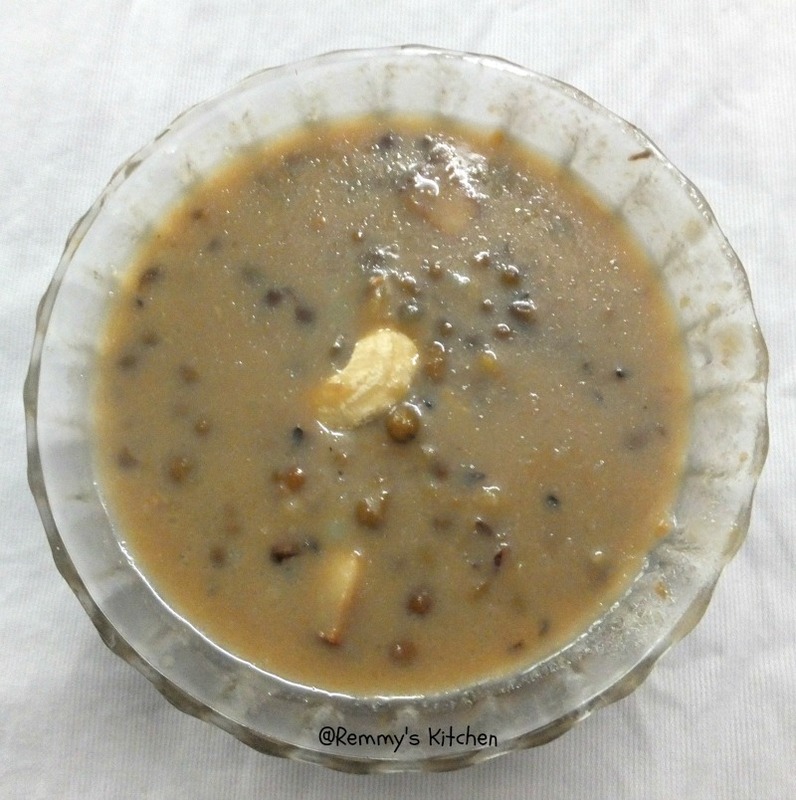 Yea green gram payasam don't have wonderful look but it tastes heavenly..I know this pics won't tempt you but believe me..it is a tasty dessert with less ingredients..
Green gram is rich in vitamin A, B ,C and E and it is a low fat food with high protein content. Pressure cook the washed green gram until it turn soft. Heat a pan with ghee fry both cashew and coconut bits (forgot to click while frying coconut bits). Drain it and keep aside. To the same pan add the cooked green gram. Grate the jaggery and melt it in 1.5 cups of water and filter it. Let it boil until it reaches little bit thick. 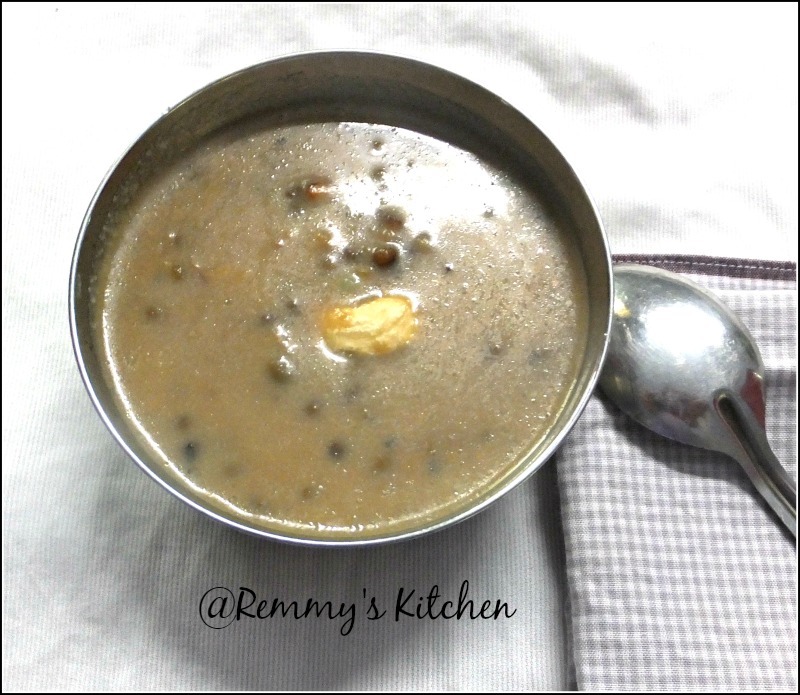 Let it cook till the payasam become thick. Add in crushed cardamom and mix it well. You can fry the green gram before preparing payasam and you may crush it in blender. You can use 2 cup thin coconut milk and 1 cup thick coconut milk.Cook the green gram in thick coconut milk and finally add thick one. If you have shortage of coconut milk use full fat cows milk as a substitute. Nice. I like the addition of ginger to further elevate the taste. 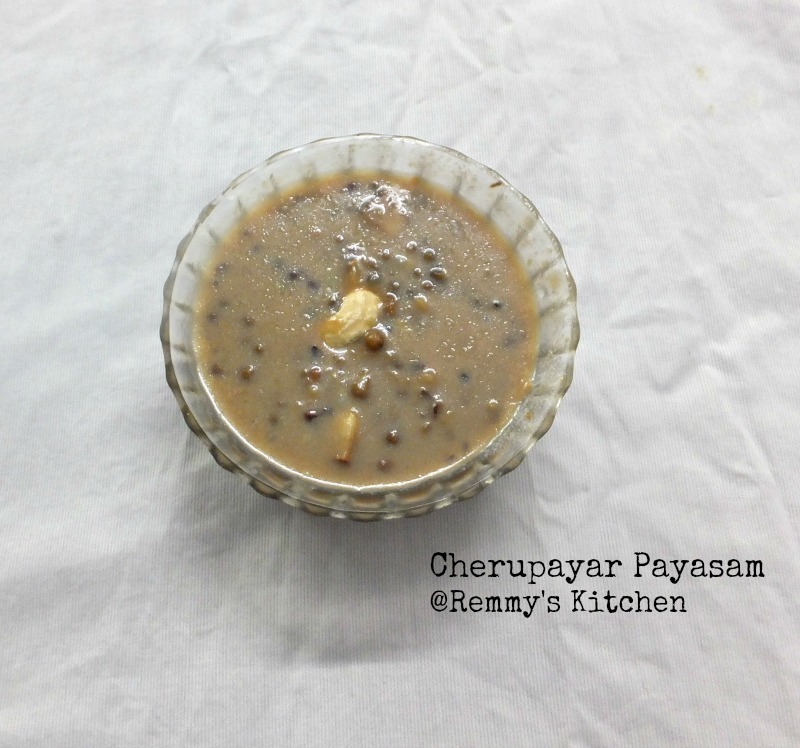 I'm not a great fan of payasam but for those who like it - this is an interesting recipe. payasam in any form is my fav..looks yummy! The ingredients look delicious so I suppose all combined then it would be quite a tasty preparation. cherupayaru paysam looks delicious love it.